Vampires, when they're done right, never get old. I'm not necessarily talking dark and evil, but edgy, supernatural, and without even a hint of sparkles. 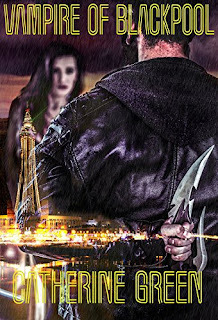 Vampire of Blackpool is one of those books that does vampires right, a quick read that left me wanting more. Catherine Green spins a tale of a vampire, a witch, a vampire hunter, and a vampire detective that has five-hundred years of history behind it. Meredith Hanson is an utterly fascinating protagonist, a tired, jaded vampire who has grown deliberately careless, just looking for a confrontation. A beautiful monster, she opens the story by feeding upon a pair of teenage lovers, and then flying out over the ocean to dump their bodies. Samantha Morris, on the other hand, is the kind of young woman who defines romantic protagonist. She's a cute, innocent little witch, but one with claws and a backbone. Her flirting with Meredith open up the story in several ways, giving Meredith a reason to live again, while she plays referee between her and Ryan James, the vampire hunter. One brings out the worst in the vampire, while other brings out the best, forcing Jack Mason out of the shadows. A fast-paced read, Vampire of Blackpool has just enough room to build the characters and establish a little world-building, without getting bogged down in details. Thanks for your review, much appreciated! Blackpool is one of my favourite places to visit so that mixed with vampires could be interesting!